Issue 1: Wages of all sectors/levels should be analysed and policies should be implemented to ensure a fair wage for everyone. Locals should be encouraged to work in the industries where labour is required (e.g. construction / maintenance). Instead of importing more foreigners to fill such spaces and keeping the wages suppressed, government should actively regulate and provide protection to the workers wages in this aspect. Better benefits / corporate welfare could be given to workers as an alternative but their salary should be sustainable for today's economy. Issue 2: Wages of government salaried employees should be revised. The wage of an MP should be equivalent to that of an associate manager which is around $6,000 to $8,000/mth while a cabinet minister should get an equivalent of a managing director pay of $15k/month. The prime minister should get maximum $50k variable bonus that is pegged to an annual happiness survey of Singaporeans done by SingStat and audited by an independent firm with the results published every year. The president salary should be pegged to an average pay of foreign heads of state with a variable bonus of maximum $50k that is pegged to the survey as well. Issue 3: Provide a legal framework that protects citizens from exploitation. This framework should include a law that prohibits Companies from contacting citizens for a certain period of the day. Best time would be 9pm to 7am and it should include a law to protect workers who work from home as well. 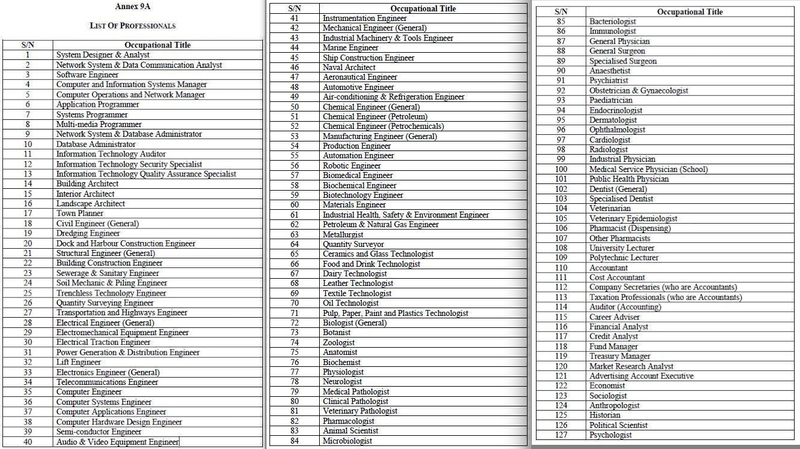 Some of these jobs can already be covered by locals (e.g. software engineer, financial analyst, Auditor). Instead of letting foreigners come in freely to takeover local jobs / suppress the wages (see point 1), the government MUST revise this list to ensure that the true Singaporean Spirit do not become diluted with half-baked professionals with questionable qualifications. Issue 2: Revise MOE Foreign Scholarships and place more stringent checks on SM2/SM3 scholars. In case you don't know what SM2/SM3 are, they are the classifications for "scholars" from China who come to Singapore to study and have a bond to work in Singapore typically for 3 - 6 years. SM2 are students who are in their "JC" equivalent and came here to siam the gao kao(高考) in China, while SM3 are those who took their gao kao(高考) and couldn't get into Ivy League schools and thus chose Singapore as 2nd choice as a stepping stone to USA. Do note that these students are educated in China for most part of their life and thus are the ones who have the China accent when speaking in english/chinese as compared to naturalised PRs who came to Singapore since kindergarten / primary school. A number of SM2/SM3 scholars whom I know personally had expressed their intentions to convert to Singapore citizens during their bond here;reason being it is easier to get into America with Singapore citizenship than China citizenship. That is why the government should revise the quota on the number of SM2/SM3 scholars and restrict the type of major they can take to relevant areas which we are lacking of, e.g. Chinese Teachers. SM2/SM3 scholars should also go through a proper integration programme and to pass an exam on Singapore's history before they are given the scholarship. There should also be a quota on the number of foreign nationalities in each dormitory for the student so that these China students will mingle with locals instead of forming their own clique of "mini-china" groups much like our HDB racial policies. Issue 3: Introduce a foreign nationality limit for companies. This means that every companies should not have an X percentage of its staff to comprise of only a certain foreign country. This is to prevent foreign managers from choosing to hiring their own foreign counterparts instead of locals and to bring better cohesiveness and diversity to the companies operating in Singapore. However, there will not a limit for locals as this is after all Singapore and Singaporeans should not be limited to Companies operating here. Issue 1: Provide a nation wide real time access to the public transport services in Singapore. Everyone with a mobile phone should be able to track and know the buses travelling along the route that they wish to board. Just take a look at Hong Kong and Taipei. If I remember correctly, Hong Kong's NWFB and Citybus provide a real time map of the buses that are plying along the route in addition to showing the fare and estimated time of arrival. Please implement this in Singapore as well and it is not hard given that we have ez link system tracking the distance of the buses already. Data privacy shouldn't be an issue since the buses are all public and we only track them while they are in service. Issue 2: Provide a proper framework for Public Transport Fares. Price segmentation should be introduce for Citizens, PRs and Foreigners. Citizens should be paying the minimum sum because after all, public transport should benefit the citizens of the country, not profiting from them. PRs should be paid a rate at which the maintenance of the equipment requires and Foreigners should be charged a premium during peak hours so they will be encouraged to turn to private transport (such as taxis and thus boosting the economy). A nationwide Photo-integrated Ez link card much like the student card can be implemented (we already have the foundation since we have the adult concession) and everyone should have one to gain access to the citizen's pricing. Issue 1: To place a legal limit on the amount of tuition fees that local public universities can set. Tuition fees should not be more than $10,000 for most courses per academic year and the interest for tuition fee loans should be kept to a minimal of 2.5% or peg to the housing interest rate instead of the prime bank interest rate. Universities should be encouraged to look for alternatives to save cost instead of raising tuition fees. Issue 2: To introduce social integration classes for foreign students at the primary and secondary school level. Similar to SM2/SM3 integration classes, there should be a social integration classes for primary / secondary school students who are foreigners in addition to social studies. It is important that foreigners understand the culture of Singaporeans so that they may appreciate the fruits of our founding fathers instead of just abusing it for their own agendas. Issue 1: To bridge the gap between private clinicians and public clinicians. Right now, private clinicians, including private hospitals store their own medical data. Public hospitals have their own records of data in addition to something called the National Electronic Health Record (NEHR). The government should try to link both public and private hospitals as well as the departments so that patients, especially our pioneer generations, can have an easier trip to the hospital instead of waiting for different departments and going down to the hospital multiple times to visit different departments. Issue 2: Bringing healthcare to the community. If you are a working adult now, you should know that it is hard for you to visit a doctor (unless you are in public sector or in a company where you can keng). Thus, it is hard for most of us to check our own health. The government should start an initiative for Singaporeans to monitor their own health and view their own health record through mobile apps and keep track of their own health so they don't need to be afraid of a sudden cancer or stroke finding them. Health checkups should be subsided , not free, for those who cannot afford. Issue 1: Reduce the number of NS to 1 year for citizens and 1 year 3 months for 1st generation PRs. Introduce a 3 month physical fitness camp for those who cannot pass their NAPFA test instead. The purpose of NS is not just to prepare our citizens to defend the country. It is also a form of nation building. That is why 1st generation PRs should and must serve a mandatory NS of 1 year 3 months while physically fit citizens should serve at 1 year of NS. Those who are not fit enough should participate in a 3 month physical fitness camp that train up their body instead of rushing them like the current BMT system. After 1 year of mandatory NS, these NSFs should be given the option of carrying on with an additional year of NS that is paid a regular's pay or ORD. This way, we can encourage those who really like to defend our country to defend our country and let those who are excel in other areas to serve our country in more useful ways. Issue 2: Reduce liable age to 30 years old for WOSE and 45 years old for officers for those who served NS. Low Key ICTs should be limited to a maximum of 10 for WOSE and 15 or Officers to prevent abuse. Issue 3: Introduce a mandatory 10 weeks BMT for ALL citizens/PRs of Singapore regardless of gender. Yes the men should serve a year but it will be useful for the women to know a bit or two of the military training as well. BMT should not be about tekkan. Instead it should really be about how to survive in a war environment, weapon proficiency, basic martial arts, signals and all the things one need to fight in a war.